Peanut Butter Sparklers are one of our best-selling treats and this collection of 22 means there are plenty to share at the office, with family or friends. 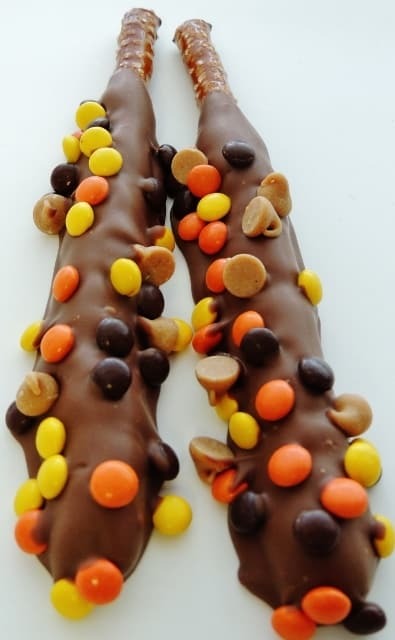 Peanut Butter Sparklers are an 8″ salted pretzel rod covered in creamy peanut butter, dipped in rich milk chocolate and sprinkled with peanut butter candies. Individually wrapped in clear cellophane they come 22-count in a full color, disposable front-reach display. Order one for the office, for the big party or just to have on-hand. We always knew our chocolatiers were scary good at creating new gourmet chocolate treats but they may have outdone themselves with these Peanut Butter Sparklers. If chocolate could dress up for trick or treat, then this would be what it wears! Here’s the perfect Halloween snack to make goblins of all ages howl with happiness. Skip the ordinary candy this Halloween and go for the good stuff. 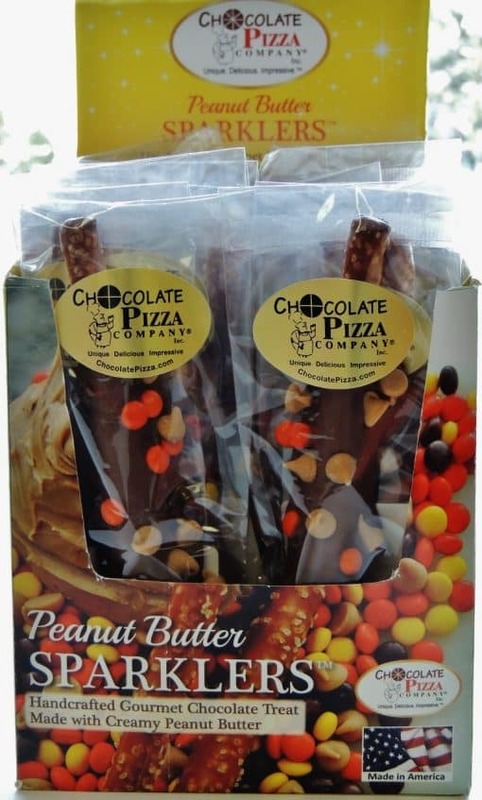 We have a pack of delicious Halloween sweets that are all handcrafted by Chocolate Pizza Company. 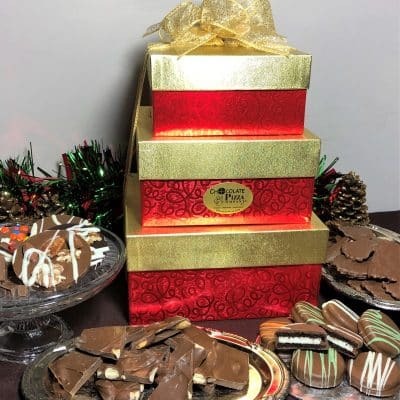 We use the highest quality Swiss-style chocolate available and add a creative touch that makes all of our confections unique, delicious and impressive. 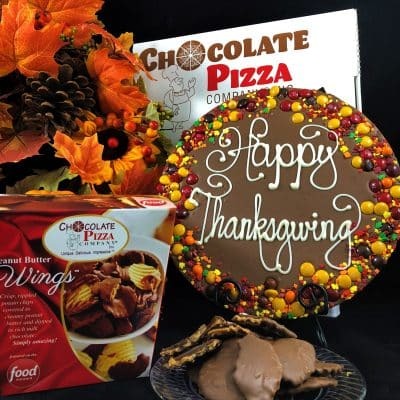 People love to get a gift from Chocolate Pizza Company because they know it is going to be awesome. Our line-up of Halloween candy favorites includes the Spooky-licious Chocolate Pizza, Halloween Avalanche Chocolate Pizza and our hand-decorated Happy Halloween Chocolate Pizzas. Want something smaller? Try a 6 oz Mummy Slice with its milk chocolate “wrapped” in white chocolate with sugar eyes peering out or a Spooky-licious Slice topped with chocolate candy and sprinkles in the scary colors of the season. 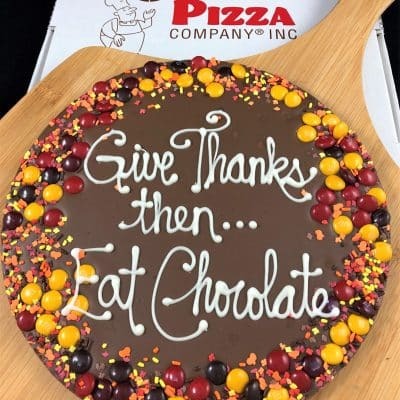 Chocolate Pizza Company has been featured on Food Network, Discovery Channel, NBC’s Today Show and other major media both nationally and internationally. Everything we make is handcrafted by skilled chocolatiers – no mass production by mindless machines for our treats including the Halloween peanut butter cup. You can taste the difference our chocolate makes and see the difference our chocolatiers make in creating gift ideas that are one-of-a-kind. After all, who makes better chocolate than Chocolate Pizza Company? Nobody.